exhibited in the Douglas Hyde gallery, Autumn 1997. 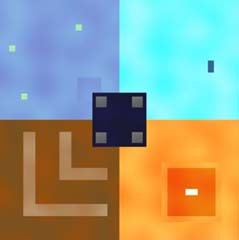 A game where the player navigates a virtual space using only sound, possibly on a screenless, handheld console. The prototype game that has been developed to prove the concept, has four main areas based on the four elements earth, wind, water and fire. Located in the centre of these areas is a big, bad and nasty machine intent on destroying the world. Each of the four areas have an ambient sound like running water or crackling fire. Within each of these areas are characters like frogs or a crow. Each area has a key. The object of the game is to explore the elements and find the character in each area that has one of the four keys. When the player finds the 4 different keys they can then save the world by going into the machine and turning it off. If a player went into the machine without all the keys, they would die and have to start again. If there is a sound in front of a person the levels of the sound arriving in each ear are the same. When the person turns say to the right, the sound will seem louder in the left ear. As the person moves relative to the sound its volume will increase or decrease and get drowned out by other sounds. This has been optimised for cosmoplayer beta 3a. before using the arrow keys to navigate. Link to Silicon Graphics for their Cosmo Player. The player can navigate the game space with sounds because of the following features. The elements have different ambient sounds, so the player can tell which quarter they are in. The machine is in the centre, so the louder its sounds are relative to the elemental sounds, the closer the player is to the centre. Conversly, if they can't hear the machine, they must be near the edge. Each of the elements' ambient sounds are located near the corner of the world, so if the player hears a mix of machine, wind and water they are somewhere between these points. All the sounds are spatialised so the person's orientation can be discerned by listening in which ear each sound is loudest. This visulation of a possible interactive audio game console allows single left or right handed control, has interchangeable credit card game cartidges, is totally mobile and can be played anywhere from the bed to the bus to the classroom with a set of standard stereo earphones. The environment was created in 3D Studio Max along with animations, This was exported into VRML 2.0 format for navigation through the scene. Sounds were aquired from various sound libraries and modified in Sound Forge. Greater interaction was provided by modifing and adding to the VRML code generated by the exporter.